This all-in-one dinner has quickly become a family favorite! 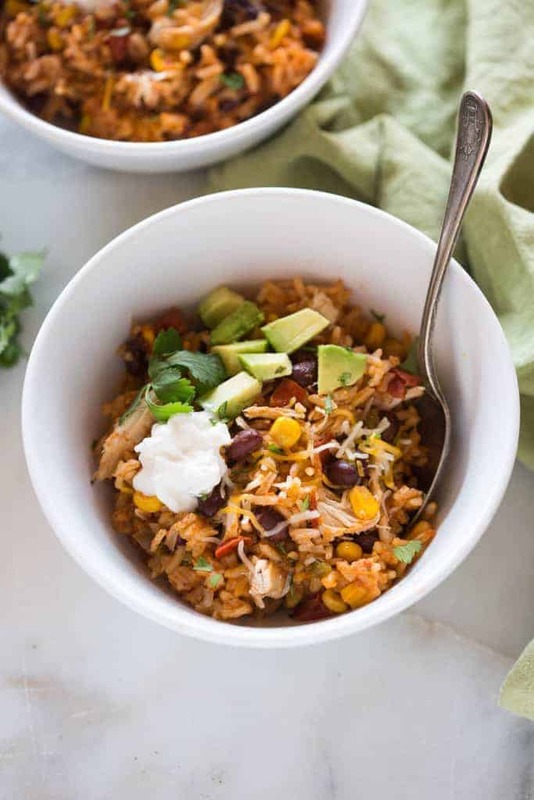 Instant Pot Chicken Taco Bowls all cooked together in one pot, with rice, black beans, corn, salsa, chicken and seasonings. I’ve been planning new recipes to make and share with you all this year, and I reached out on my Instagram page to ask for your recommendations. It quickly became clear that my readers want more easy dinner ideas–including more recipes you can make in your instant pot! If you’ve been following along with my blog at all, you may know my affection for “bowls” : complete meals–including grains, protein and veggies, served together in a bowl. These are a few of my absolute favorites. The instant pot takes my affection to a whole new level by allowing me to add all of the ingredients to the pot at the same time, without any prep! YES!! This recipe is a busy mom’s dream come true. I first got the great idea for these bowls from wondermom wannabe. I knew I wanted to use white rice, and adjust the ingredient ratios, for less rice. I also played around with the recipe several times to make sure the rice and chicken cooking times coordinated enough that the rice was cooked perfectly, and not gloopy/mushy, and the chicken not dry. The end result was just perfect! It really doesn’t get much easier than these Chicken Taco Bowls, made in the handy, dandy Instant Pot! Start with adding a little broth, and 2 chicken breasts to the bottom of the IP. Sprinkle taco seasoning over the chicken. If you don’t have a packet of taco seasoning, you can make it really easily from scratch. Top with black beans, corn, salsa, and uncooked white rice. Add the rest of the chicken broth. BAM! That’s it! Just secure the lid, and follow my setting instructions. While the mixture cooks, prepare your toppings. One important tip I would offer, when everything is done cooking, is to fluff the rice really gently with a fork. If you take the lid off and stir the mixture when the rice is piping hot, you’ll end up with rice that gloops (is that a word?) and sticks together. Yuck! So just fluff it with a fork, then put the lid over it and allow it to rest for a few minutes before serving. I developed this recipe for use in the 6-QUART INSTANT POT. If you’re using a larger IP you may need to add more liquid so that you don’t get a burn notice. Can I use brown rice or Quinoa? Yes, you could use brown rice but some adaptions will be needed. Add 1/4 cup more chicken broth, and I would also suggest using chicken thighs, or cooking the chicken separately, so that it doesn’t get overcooked/dry. Brown rice takes longer to cook in the IP–about 22-24 minutes (22 for low elevations, 24 for higher). Then follow the same pressure release instructions. If you’d like to use quinoa instead of rice I recommend cooking it separately. Quinoa only takes 1 min on high pressure to cook, so if used in this recipe it would be very overcooked. Yes! To make this recipe with frozen chicken breasts, follow the directions exactly as they are listed below (but use frozen breasts). Cook on manual (high pressure) for a total of 10 minutes, instead of the 8 minutes it calls for. Then allow the pressure to naturally release for 12 minutes. You could substitute the chicken for ground beef or turkey. Sauté the meat in the bottom of the IP, first, before adding the rest of the ingredients. You could also leave the chicken out, to make this a vegetarian meal. Add additional veggies like chopped bell pepper, zucchini, or stir in fresh spinach at the end. If you don’t have black beans I would suggest pinto, or really any other type of bean you like. If you’d like to leave the rice out, you only need 1 cup of chicken broth. Cook time is the same. The toppings can really make this dish fantastic! I would suggest a little shredded cheese, a scoop of sour cream or plain greek yogurt, and definitely some fresh chopped cilantro and avocado. You could serve warm corn/flour tortillas or tortilla chips on the side. You could also top with some shredded lettuce or chopped spinach. This all in one dinner has quickly become a family favorite! 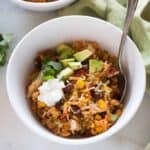 Instant Pot Chicken Taco Bowls all cooked together in one pot with rice, black beans, corn, salsa chicken and seasonings. Remove IP lid and gently FLUFF rice with a fork (Don't stir it!). *This recipe is for use in a 6 QUART INSTANT POT. If using a larger instant pot, In step 2, add an additional 1/2 cup of chicken broth to the bottom of the pot (1 cup total in step 2). Try these INSTANT POT MEALS. Can I use brown rice or brown jasmine rice? This turned out so well. The instructions are easy to follow and the dish tasted delicious!